LIGHTWEIGHT and POWERFULL - Matte creates wonderful sense of touch. Keyboard is made of Aircraft-grade. 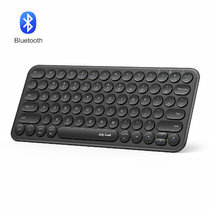 GREAT for VACATIONS and TRAVEL - If you love to travel, then you possibly will need this keyboard rather than a large laptop computer if you take a tiny tablet or smart phone (iPhone). RECHARGEABLE BATTERY - Users get pleasure from up to 48 hours of writing time with only one charge. The Wireless Folding Bluetooth Keyboard has a rechargeable lithium-ion battery. Standby time is up to 560 hours. 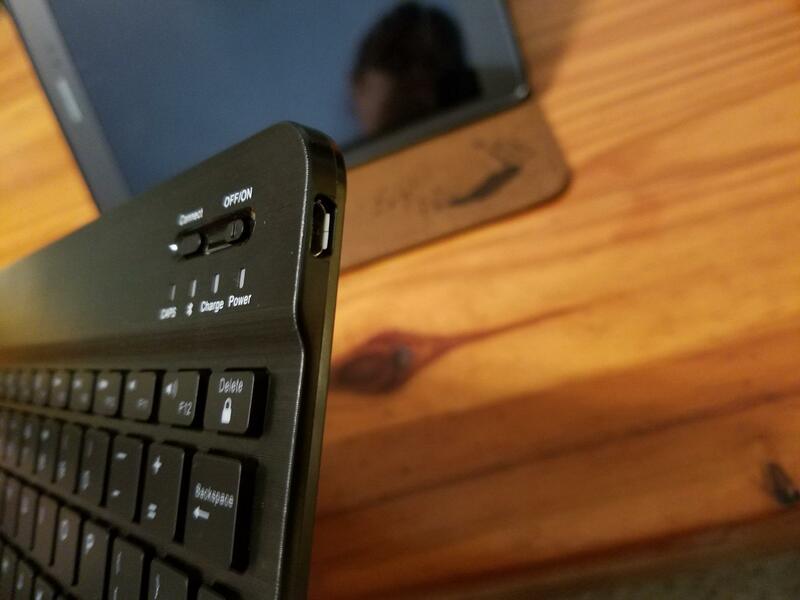 INCREASES PRODUCTIVITY - This wireless mini bluetooth keyboard permits users to instantly flip their tablet or phone into a tiny laptop computer for fast, comfortable typing. While thumb-typing or finger-swiping on your smartphone screen may be good enough for tweeting or texting, more wordy activities -- like typing long email messages, taking notes at conference sessions or writing documents like this one -- are grueling at best. For that, you need a physical keyboard. Universal Foldable Keyboard is the perfect travel companion—its ultra-thin, lightweight, compact design lets you easily take it wherever you go so you can get more done on your tablet or smartphone no matter where you are. Works great and it's compact, can be used for several devices that I have. I would recommend this product to a friend. 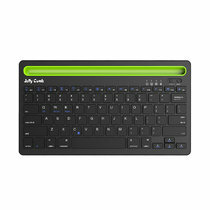 Great keyboard for use with Android tablet. 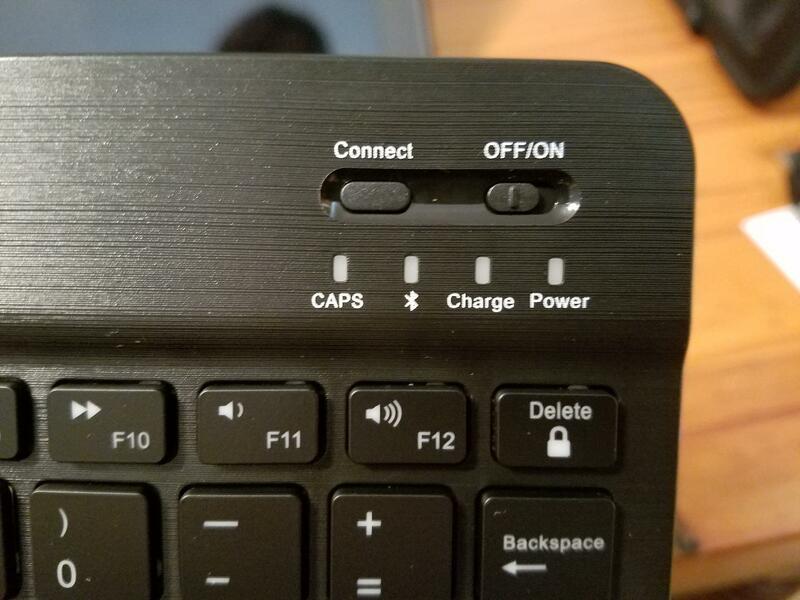 Keyboard connected immediately and works perfectly. Really nice to have the touchpad in the keyboard! Sturdy design that folds up very compact. Highly recommended! I use this item almost daily and it is great! I already had people ask me how to get one for themselves. 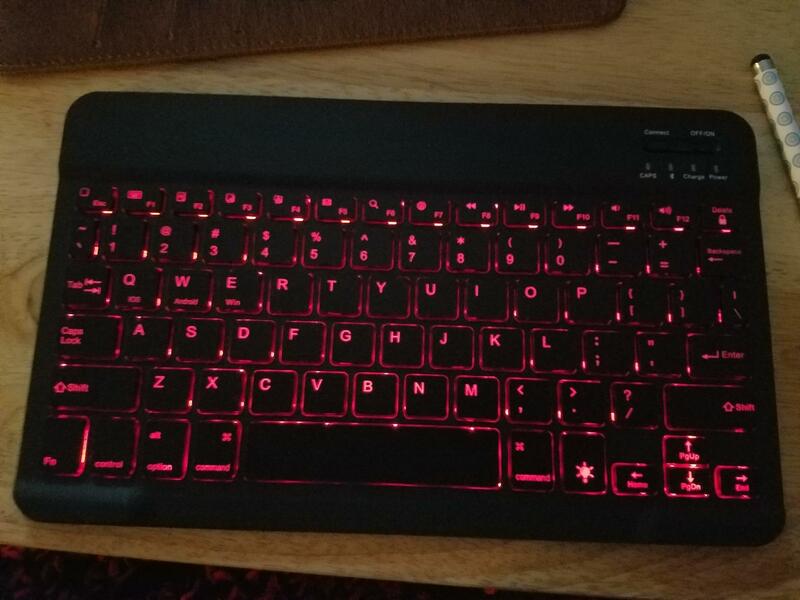 I purchased this KB for use with an apple tablet 2018. This keyboard is not really user friendly for apple. It does work better for windows. 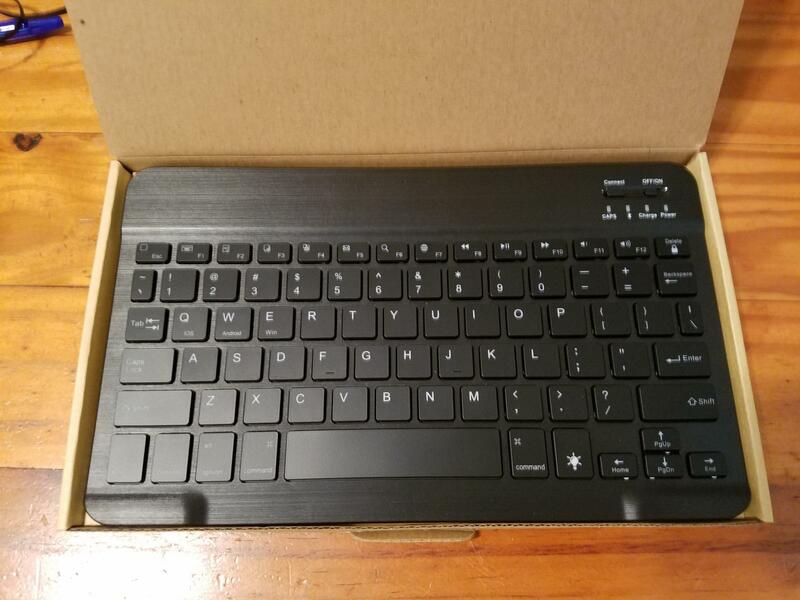 It is a mini keyboard, about the size of a keyboard on a Surface Pro 3 tablet from Microsoft (the cloth one). It may be a little smaller. I would not use this as my main keyboard because it is so small. I use it when convenient, especially at night in the dark. For that purpose, the price is right. Also, it has great battery life. Works great, I use it all the time and it holds a charge for quite a bit of use. 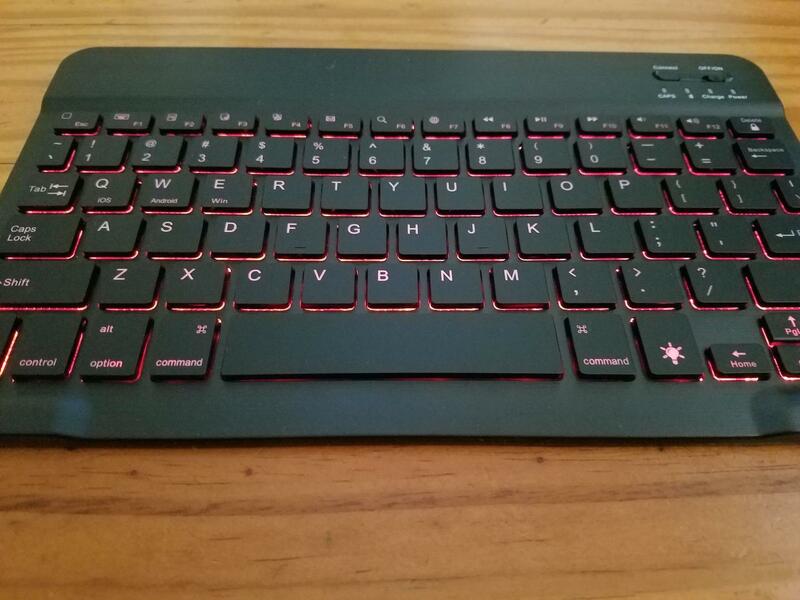 good key travel & led back-lighting, nice finish on the surface although the keys feel plastic-y and the key spacing needs some getting used to, but that's expected for a compact keyboard like this & at this price. Using it with my Samsung tablet in meetings. Love it! What a great product. Unfolds to pretty much a full size key board, yet folds into a very compact piece. I would like it a little better if the board locked in the open position. The interface with my notebook computer was accomplished very quickly and I have used it to type emails several times now. For the price this keyboard has been MUCH better than expected. It works extremely well - like the feel, definitely like the backlighting, love the size and weight. Suggested improvements, 1) improve the backing used on the bottom side - it's very cheap feeling (although likely needed to keep cost down), 2) increase the Bluetooth timeout/time to sleep - waking the keyboard back up after pausing a few minutes can take a second, 3) set the default backlight to the green/blue/white shade rather than red, and 4) multiple device option. Would recommend the keyboard and would buy again. Very neat and it does what I need it to do! This works well, is very light, durable and has a long lasting battery. It's also uncomfortably small for people with sizeable hands. Love this! 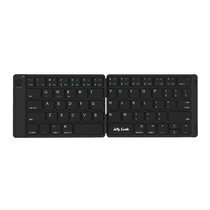 I have been looking and toying with the idea of getting a small bluetooth keyboard. I am glad i waited until i found this one. I love it! It's not too small or too big. It paired seemlesly with my Samsung Galaxy Tab A and Samsung Galaxy S7. It compares in size with my Tablet very nicely. and I love love love the backlit keyboard. honestly it's the only way to go, even when i bought my ROG laptop. Backlit keyboards are always a reqirement for me. so this was perfect! 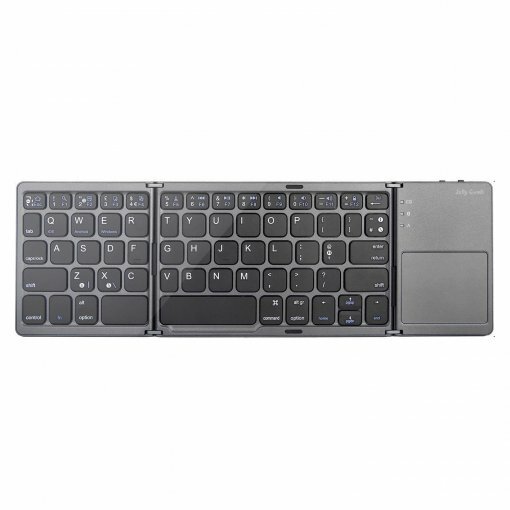 I would highly recomend this to anyone in search of a wireless portable keyboard. nice quality, perfect sizing and they kept the keyboard layout normal. THANK YOU for that! 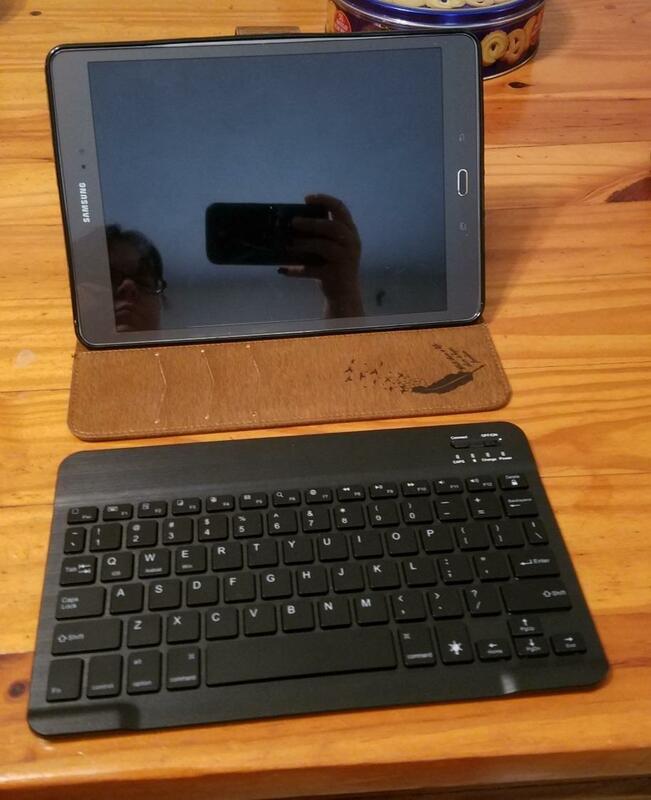 the only reason I didn't give 5 stars is because it did not come with the tablet stand ... not that i needed it, nor wanted it, nor was it a selling point for me, but it may be for someone else. would be nice to have a few tabs underneath to give some angle. I do quite a bit of my shopping online, particularly at Amazon, so like you I depend on reviews to be honest so I can make an informed decision. ALL of my reviews are on products I purchased on Amazon, I have never reviewed an item I did not personally buy ON Amazon. So, I hope this has been helpful for your shopping needs. If you have a question I will try and answer it to my best ability. Enjoy your shopping! Great product. I love it for taking notes in class on my ipad definitely would recommend. Backlighting is nice and fairly bright and a nice touch.